We are born spiritually in the sacrament of Baptism. 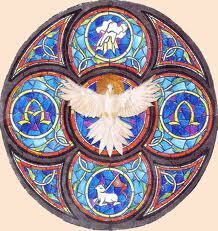 We become sharers in the divine life of the most Blessed Trinity. As we practice the virtues of faith, hope and love, we unite with Christ in His Church in offering worship to God. When we do this we grow in grace and goodness. Before Confirmation, our spiritual life is like that of a child, and is largely self-centered. We tend to be preoccupied with our own needs. 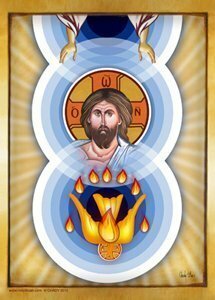 We cannot be self-centered if we understand what it means to be a member of Christ's Mystical Body. that it will be strong enough not only for our own needs but for the needs of others with whom we try to share it. With the onset of adolescence a child begins to assume the responsibilities of adulthood. He begins to see his place in the total family picture and in the community. Similarly, the Confirmed Christian begins to see more clearly his responsibility to Christ for his neighbor. He becomes deeply concerned (or ought to) with the welfare of Christ-in-the-world—which is the Church—and the welfare of his neighbor. This is why Confirmation is a spiritual "growing up". Strong in his faith and with love for others which stems from his love for Christ, he feels a continual concern for others. He wants to do something worthwhile for others—something to ease their burdens and make more secure their promise of life eternal. His words and his actions proclaim to those around him: "Christ lives, and He lives for you"! The grace to do this is the grace which Jesus promised to His Apostles (and to us) when He said: "You shall receive power when the Holy Spirit comes upon you, and you shall be witnesses for Me. . . . even to the very ends of the earth" (Acts 1:8). From ancient times, olive oil has been looked upon as a strengthening substance. Athletes were accustomed to bathing in olive oil before taking part in athletic contests. The significance of the holy oils used in the administering the sacraments represents the strengthening effect of God's grace. Besides the distinct and special blessing which each holy oil receives, chrism has another difference; balm has been mixed with it. Balm is a fragrant substance obtained from the balsam tree. The holy chrism symbolizes the "sweet odor" of virtue. It tells of the spiritual fragrance, the attractiveness that should characterize the life of the person who puts his Confirmation graces to work. We need to allow the grace to work!!! The cross which is traced upon the forehead of the person being confirmed is a powerful symbol if it is understood and acted upon. 0 "Do I actually live as though there were a visible cross branded on my forehead, marking me as 'Christ's man' or 'Christ's woman'? 0 "In my daily life, do I really bear witness to Christ?" o "By my attitude towards others, by my treatement of those around me, by my actions in general, do I proclaim what it means to be a Christian living the Gospel'?" If the answer is no, then it means that there is a lot of grace being wasted. It is a grace which is available to me in abundance if you use it. Its strengthening grace will enable us to overcome our human pettiness, our cowardice in the face of human opinion, and our fearfulness of sacrifice. 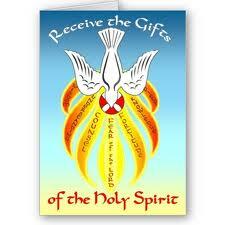 In Confirmation, the Bishop or Priest places his hand upon our head and calls the Holy Spirit down upon us. 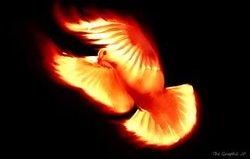 The Holy Spirit can, if we will let Him, transform our lives. Without Baptism we cannot go to heaven. Without Confirmation we can get to heaven, but it will be harder. In fact, without Confirmation it would be easy to lose our way entirely, easy to lose our faith. That is why it is of obligation for every Baptized person to be Confirmed. We know that Jesus did not institute any of the sacraments "just for the fun of it." Jesus instituted each individual sacrament because He foresaw, in His infinite wisdom, that we would have need of certain special graces under certain circumstances. He foresaw the dangers to which our faith would be exposed. In all of these circumstances, the grace of Confirmation comes to our aid (if we will let it) and irresistibly pushes back the urgings of self-will, and helps us to preserve our sense of values so that our faith may triumph.